Mt. Merbabu is famous for its extreme weather, which became its charm. It can go from extremely hot at noon to extremely cold at night. You have to take care of your skin if you don’t want to get dry and crack skin while Merbabu trekking. Use son-block under scorching sun and lotion when the temperature drops to cold. And also always have first aid kit in your bag. No one wishes you to get an accident, but just in case you or someone else needs it. Aside from that, you should bring enough water, because Mt. Merbabu is known with its low source of water. At a high elevation, the temperature can have an extreme difference. At noon, the sun is blasting hotter than the land, maybe because of the higher position. Meanwhile, the temperature can easily drop to single digit as a place getting higher in elevation, the air pressure will getting lower. The low air pressure will make the temperature dropped. For mountain trekking, always wear thick clothes, it will prevent you lost your body heat. But always make sure that even if your clothes are thick do think about the comfort value. You have to walk your way up the mountain, difficult to move clothes will only be a handicap. Also, bring masker, beanie, and gloves to keep you warm. Just as mentioned at the previous point, the temperature will be scorching at day time. To prevent it, recommended to high after 12 PM. The trek will take time 6 to 7 hours. It means if you start to hike in the morning, you will still hiking at noon. In that case, you will easy to get tired and may cause for dehydration. It’s better to start after 12 AM because you can rest at the camping ground at the summit at night. Some people choose to hike at night instead, to see the sunrise from the summit and at the same time avoid the sun. For the amateur, do get an expert for a guide if you want to Merbabu trekking at night. That way, you will get pointers along the way and assure your safety. The forest at Mt. Merbabu is famous for its wild monkeys. They're not afraid to steal the food from the human. There were many cases about the stolen food at the camping ground. They think the mountain is their domain. Do keep your eyes on your food if you don’t want to starve up there. And the last tip is the basic manner you have to have when Merbabu trekking, bring down your trash. The place is clean when you get there, still clean when you’re there and keep clean when you leave. You climb all the way up there to admire the beauty of nature, not to dirty it. 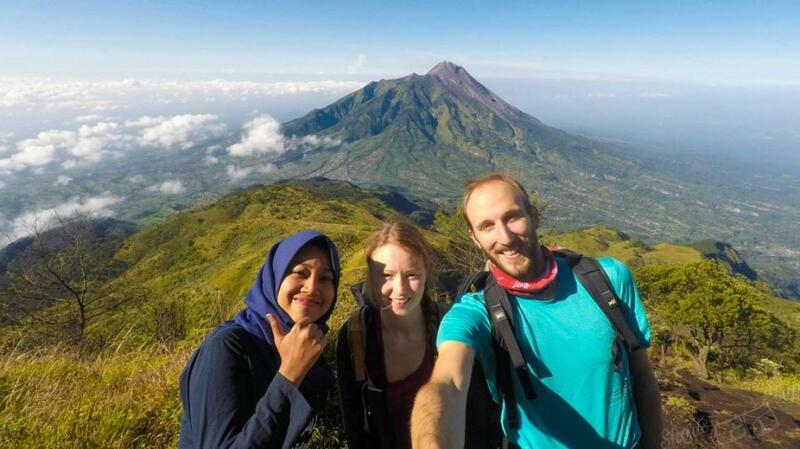 Either you will be going to Merbabu trekking on your own or with others you can follow the tips above. And lastly, there’s a request, train your body before the day like do some light exercise. It can prevent you from getting cramps while hiking.